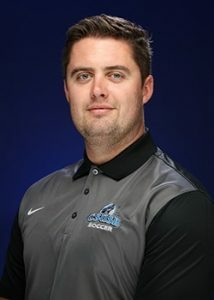 Darren Leslie has officially been named head coach for men’s soccer, after a successful year as interim head coach. Leslie intends to assist in the development of the men not only as players but as individuals, too. He works very closely with the team to ensure that they maintain their academic careers as well. “We are always looking to get the best grades possible in our classes, and Darren makes sure that we all hand our grade checks in to make sure that we are eligible for when the season comes around,” mentioned center back Nic Turkington. The team has excelled since their previous year on the field. They entered the league and were expected to finish second to last, but ended up in fifth place. In the process of the transition, the squad was also able to keep up their studies and actually obtained the highest GPA in the school for athletics, with a 3.4 average, according to CSUSB News. Many players have displayed their admiration for Leslie. “We all wrote a personal email to the Athletic Department vouching for Darren, as he has helped our squad in numerous of ways, this was the least we could have done,” said midfielder Trevan Estrellado. This season the team is seeking to surpass last year’s unimpressive 4-9-3 record. Leslie had recruited potential players as interim head coach, but many players decided to join local teams in the league. Becoming head coach has helped him attract more players by allowing him some stability in actually signing them. “We have lost a lot of players from last season due to their four years being up in the NCAA, although as a squad we believe that we can push on and try and beat our last season’s record,” stated center back Ross McGuigan. Last season the squad had an impressive record of overall 10 wins, 1 draw and 6 losses, compared to the year before. The team exercised extensively in the pre-season which resulted in some of their wins. In addition to this, the squad seemed to be playing with a lot more confidence and freedom on the field. “Coach brought a philosophy to the game that many of our opponents were not expecting. For the most part, our tactics changed regularly depending on the team that we were playing, meaning many of our oppositions were not able to closely analyze us,” mentioned Estrellado. Leslie and the team are seeking support from fans next season in September, to motivate the team to work hard for the best season possible.